Find flower crafts, floral crafts projects and flower bouquet craft ideas here. Flower - the word itself fills your mind with freshness, isn't it? No wonder, flowers are considered an evergreen lovable gift. Flowers make amazing gift that can be presented to anyone. Flower crafts or floral craft projects include ideas such as making Bridesmaid bouquet or fresh floral bouquets that can be used by a bride on her wedding, while the floral bouquets can be given as gift for Mother's Day, Teacher's Day or any other ceremonious occasion. You may present it to your mother, teacher and even to your friend. Flower bouquets can be easily modified into a beautiful table centerpiece as well. Flower craft serves multiple purposes and gives you an option of making decorative pots for flowering plants, which can fit into your kitchen or garden. You may also make tissue paper flowers and use them to make garlands or decorate your gift packages. It is quite simple and kids can make them easily. They appear very attractive and look very appealing and pleasing. Some of the popular flower crafts that you can try at home are bridesmaid bouquet, decorative pots, fresh floral bouquet and tissue paper flowers. 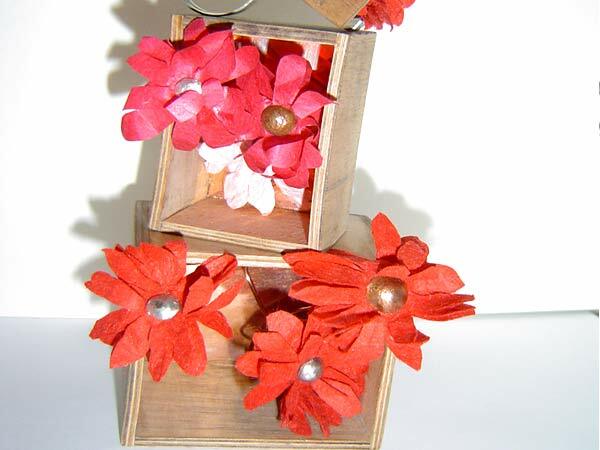 We have provided some fun ideas for making flower crafts, in our related section. The enduring aroma of flowers brings a gentle smile on the lips of almost everyone on this earth. Flowers are used on almost all the special occasion, for various reasons, right from presenting as a gift to forming a part of the overall decorations. However, one of the best uses of a flower bouquet is in the hands of a bride. A fresh flower wedding bouquet makes the dressed up bride look even more elegant and lovely. Tissue paper is one of the most popular decorative papers used for craft purposes. You can even make beautiful flowers using tissue paper in no time. You can make an entire bouquet of tissue paper flowers and use it as a great gift or decoration, on almost any occasion. You can use them to make wreaths, decorate gift-wraps, as home decoration, make garlands for Christmas tree, as wedding decorations, for keeping around votive candles and even as table centerpieces.